The EPIC Book is over 400 pages packed with information, experience, knowledge, tips, advice, lessons learned, and practical instruction. Not 400 pages of big fonts, wide margins, and huge graphics that eat up a lot space so a big page count can be advertised. 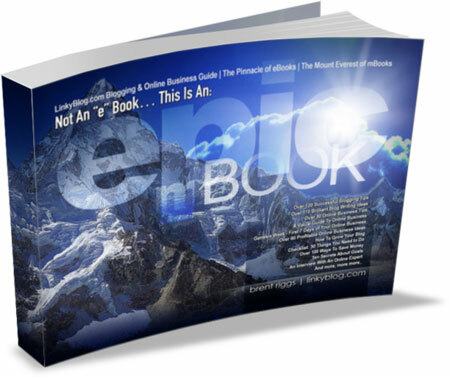 The EPIC Book has over 135,000 words, dwarfing typical good eBooks that usually average 20,000 – 30,000 words. Nor it is just a bunch of filler content and stuff you won’t read so I can advertise a high word count. Every page in this book is useful and relevant, the very best of what I have learned and experienced in the last 15+ years of being online. I was blessed to begin online way back before the general public even knew what “the information superhighway” was, before we all truly grasped what the Internet would become. What you will find in this book is the experience of a long, long time online and countless rounds of trial and error, testing, learning, starts and stops, and a relentless passion to learn everything I can learn about all things blogging, internet marketing, and online business. Must-Have Resources, Tools, & Software, Over 100 Killer Blogging Tips, 65 Great Headlines to Get You Started, Over 110 Brilliant Blog-Writing Ideas, 80+ Online Business Tips, Digital Photography 101, A Visual Guide to Online Business, Genesis Week - First 7 Days Of Your Online Business, Over 60 Profitable Online Business Ideas, Over 50 Ways To Make Money Online, Writing, Designing, Publishing, Marketing & Automating A World-Class eBook , Mistakes To Avoid – Lessons Learned From My First Dozen eBooks , Checklist: 30 Things You Can Do To Improve, An Interview With An Online Expert, A Library of Useful Articles, And more, more, more!